Original Southern Rock and Country racing. 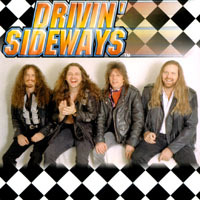 Drivin' Sideways is the brainchild of a former Lynyrd Skynyrd guitarist/songwriter , Mike Estes, and his neighbor and former Skynyrd tour manager, Paul Abraham. The two were a part of a major promotion at the Daytona 500 to introduce a CD entitled HOTTER THAN ASPHALT, a various artists project by SONY/Columbia Records that celebrated Nascar. Although the two had attended Nascar events in the past, nothing prepared them for what they witnessed in Daytona. 150,000 screaming Nascar Diehards on the edges of their seats, in eager anticipation of the dropping of the Green Flag that begins America's Race. It was a wonderful experience that left them in awe of the sport of stock car racing, and with a desire to write more songs about their favorite past time. The first song the two penned is entitled The Intimidator, a rocking tribute to Dale Earnhardt and his legacy that was handed down to him by his father, Ralph, A Nascar pioneer. Since the actual writing and recording of the song, Dale Earnhardt Jr., the son of The Intimidator, has entered the sport by winning the Busch Grand National Championship, and several Winston Cup events. Sadly, The Intimidator was killed in a racing accident on the final lap of the 2001 Daytona 500, and is greatly missed. The second song the two wrote is entitled The Ballad of Junior Johnson, a true story about another racing legend, who began his driving career as a moonshine runner in the mountains of North Carolina. The song was debuted by Performance Racing Network at the Charlotte Motor Speedway, with huge accolades from the announcers and by Junior, himself. He praised the writers by saying this song is as close as anyone has gotten to the true story of my life. The third song written is entitled What Else Would I Do On Sunday?, an anthem-like song written for the fans of the sport. The song was praised by New York Newsday, by saying Racing finally has a much-needed anthem. Jack Hurst, country music reviewer of the Chicago Tribune, says this CD is surprisingly good, and I would recommend it not only to Nascar fans but to anyone that likes good Rock and Roll. He punctuated the review with a three and a half out of four stars rating. Estes and Abraham penned three more songs together and the members of the band and Estes penned the remaining four tracks on the CD. The other titles include: Nascar Diehards, a rocking song about the obvious; Asphalt Angels, entirely written by Bird, the bassplayer, a poignant tribute to the fallen heroes of the sport; The Iceman, a driving melody about Winston Cup Champion, Terry Labonte; That's Just Racin', an up tempo foot stomper about race day ups and downs of stock car racing; Racetrack Romance, a catchy country tune about a love affair that has its beginnings in the grandstands of Charlotte Motor Speedway; Boy Wonder, a power ballad about Winston Cup champ, Jeff Gordon, who actually introduced the debut of the song on Nascar Country, a syndicated radio show; Yellow Flag Blues, a bluesy rock rendition about the advantages and disadvantages of the waving of the caution flag. The band, Drivin' Sideways, aligned themselves with a favorite charity of Nascar, Speedway Children's Charities, and donates a large portion of the profits from the sales of the CD to this very worthwhile cause. The band has played many events for the Nascar family, including a Children's Charities event at Billy Bob's in Texas, preceding the Inaugural race at the Texas Motor Speedway, a street rally in Bristol, TN, preceding the Spring race at BMS, and most recently, an event that was sponsored by the Federal Emergency Management Agency in Washington, DC. FEMA has entered the Nascar game in order to gain exposure for their emergency preparedness program, Project Impact. The songs of Drivin' Sideways have been embraced by Nascar fans everywhere, thanks to the Nascar Country radio network and John Boy and Billy's Big Show, both syndicated out of Charlotte, NC to the World. Sideways songs are also played on over 800 radio stations across America. If you are reading this, and have a love for the sport of stock car racing or if you just love good music, this CD is a must for you and all the race fans/music lovers in your family. WARNING: Drivin' Sideways will NOT be responsible for speeding tickets and/or any other moving violations incurred while listening to this recording. This is a FUN cd built around the NASCAR theme! It's great southern rock and roll put together by Mike Estes (Lynyrd Skynyrd, Classic Southern Rockers, periodically sits in with Southern Rock Allstars). I loved every single track on the CD! It was even easy to find in the search. Keep up the Good Work!